A small landlocked country in Central Africa – and the place where one of the most recent and most brutal large-scale genocides took place in 1994 – for background info on this see the separate entry Rwandan genocide. Obviously enough, this is the prime reason why Rwanda has to be high up on the list of dark tourism destinations. In fact, with regard to efforts in coming to terms with the dark sides of recent history and its commemoration Rwanda leads the field in the whole of the African continent, or anywhere outside the First World. The Gisozi Genocide Memorial Centre is the best known and most visited individual site for tourists to see, as it's located near the centre of Rwanda's capital Kigali, which is the principal entry point for foreign visitors and also offers a few more sites of its own that are worth exploring. It is the most comprehensive survey of such sites that I am aware of. It also has lots of photos (mostly in atmospheric black-and-white), some of them rare historical images. Most of those smaller local memorials are little more than memorial stones and/or areas that cover mass graves, but involve no further commodification. Still, as you tour the country, guides may point out such places as you go along and you can perhaps stop at a few for a moment's reflection. One such place that stands out in my memory is Nyange, where a whole church building in which Tutsis had taken refuge was simply bulldozed in order to kill them. The site, by the road between Kigali and Lake Kivu, is now fenced off – a bare field with bits of rubble and surrounded by mass grave markers. Adjacent is a new building, presumably part of the memorial, but it was locked when I visited the site. 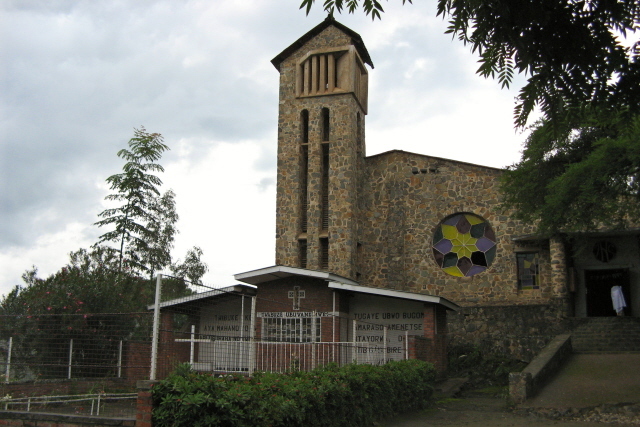 When visiting Kibuye on the shores of Lake Kivu in the west of Rwanda, it's well worth making a stopover at the Genocide Memorial Church on the hillside to the west of the town (just after the roundabout along the first stretch of the one-way traffic loop through Kibuye). 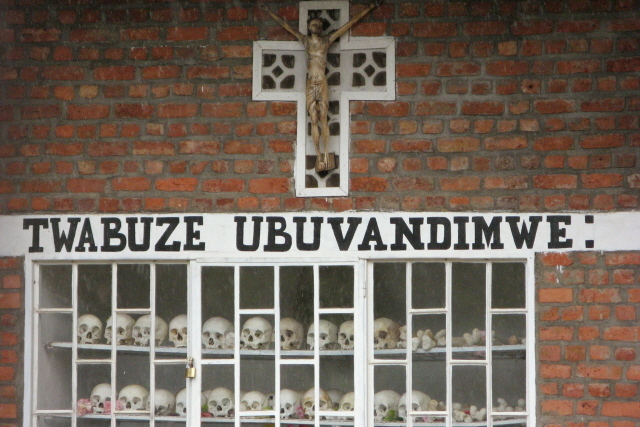 It was one of the many sites of massacres in this region, which once had a much higher proportion of Tutsis than elsewhere, some 90% of whom, however, perished in the genocide. About 4000 alone were killed at the church. The building itself now serves its original religious function again (according to my guide a plea for having the whole site turned into a memorial – like e.g. at Nyamata – was turned down by the Vatican). But right in front of the church building, a special memorial area has been constructed: two rows of mass graves with a small building at the end, all fenced off. In a window within the central part of the memorial building you can see a few rows of skulls neatly arranged on shelves. When I visited the place in December 2010, a wedding service was being held inside the church. The joyous celebration of life brought an eerie contrast to the grim presence of death and the historical weight of the place. Lake Kivu, by the way, can also qualify as an at least potentially dark site of a very different sort, namely threatening the approximately 2 million inhabitants on its shores with sudden asphyxiation – Lake Kivu is one of the world's three known "exploding lakes", where so-called limnic eruptions have taken place. This is a rare natural phenomenon that occurs when carbon dioxide saturated deep in the waters is suddenly released and escapes to the surface and surrounding shores. There have been two cases of such lake overturns in Cameroon in the 1980s killing thousands of people and cattle around its shores. 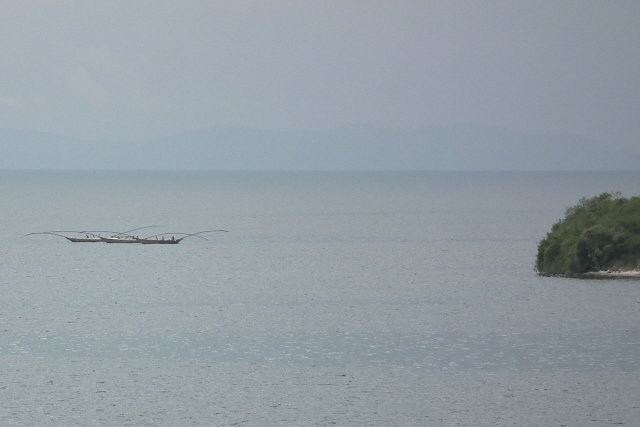 Lake Kivu is much larger than its counterparts in Cameroon and thus potentially also much deadlier. Moreover, in addition to a huge amount of carbon monoxide, its depths also contain sizeable amounts of methane. While the latter is being extracted for energy production, and is thus seen as a good thing, it also poses the additional risk of explosion and possibly tsunamis – a threat even more worrying for neighbouring Congo. Geological/historical research suggests that such events happen approximately every 1000 years or so at Lake Kivu. As it sits directly on the Great African Rift Valley, with lots of volcanic activity around (cf. Nyiragongo), it could be a truly deadly sleeping monster. Maybe it's better to stay away from its shores and make do with a glance from a distance and from higher ground … On the other hand: statistically, the odds of being there as a visitor at exactly the wrong moment in time are pretty negligible. But for the permanent residents on Kivu's shores it is indeed a sword of Damocles hanging over them. Tourism in Rwanda is of course not all just doom and gloom – far from it: by far the greatest attraction is eco-tourism, in particular gorilla tracking! The mountain gorillas of Rwanda's Volcanoes National Park are rightly world-famous. Trekking safaris are restricted and permits expensive – but that's ultimately a good thing as it should help protect this fascinating but extremely endangered species. The gorillas are undoubtedly the country's premier attraction (as a glance at any Rwandan tourism website immediately makes clear). Getting to Rwanda isn't the easiest but the journey is quite doable. There are direct flights from Brussels to Kigali two or three times a week, and various connections via Kenya, Ethiopia, Uganda and South Africa. They're not necessarily cheap though. For more, see under Kigali. Accommodation and getting around Rwanda can also be pricier than you might expect from a Central African country – but remember that tourism revenue also goes directly into rebuilding the country and a fixed percentage is fed into improving the lives of rural communities not directly benefiting from tourism. A single gorilla permit now costs a whopping 1500 USD (that is: per person!)! (First they increased it by a full 50% in June 2012 to 750 USD, from the already hefty 500 USD that I had to pay when I was there, now they even doubled that rate). For that you get a guided trek with no more than 8 participants (plus ranger and trackers) to one of habituated gorilla groups. The hike can take between 30 minutes and several hours and vary in difficulty from a mere stroll in the forest to really strenuous and exhausting. Gorilla groups are classified according to the level of difficulty of getting to them and tourists are allocated accordingly on the basis of their apparent fitness. Once at the gorillas – the encounter is as good as guaranteed! – you get to spend about one hour with them. Nominally you are not allowed to get closer than 7 metres to them – but the gorillas are unaware of that rule and sometimes undermine it, especially the youngsters. So, is it worth the costs and effort? I'd say absolutely!! The encounter with these jet-black gentle giants, our second-closest relatives (after chimps) in the animal kingdom, is a deeply moving experience. It really is beyond words, hackneyed as this phrase may sound. Paying the steep fees for the experience is, by the way, also an important contribution to the efforts made to ensure the survival of this highly endangered species. And part of the revenue is used to support the surrounding communities – partly in an effort to discourage poaching, which is now more or less a thing of the past in Rwanda. So it is also worth it from a "moral" point of view. Too many visitors to Rwanda, however, ONLY come to see the gorillas, which is a shame, as they miss out on many other, though less high-profile attractions that the country has to offer. Even within the Volcanoes National Park itself this goes beyond gorillas; you can also track golden monkeys, for instance, and various hikes up to one of the dramatic peaks can be arranged as well (for rewarding views of the stunning scenery). 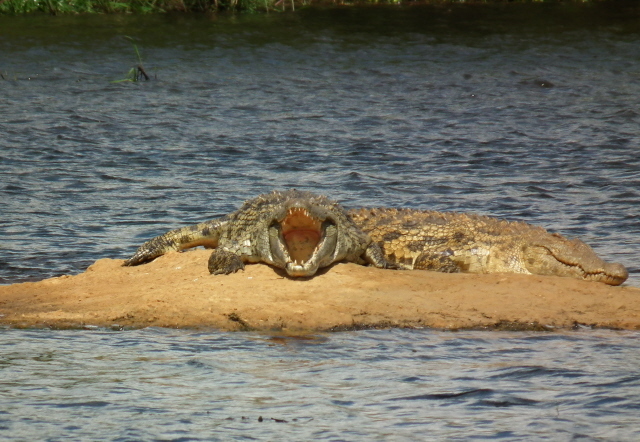 Akagera National Park in the east of Rwanda, along the border with Tanzania, on the other hand, has a bit of a hard time competing with the celebrated world-class natural wonders inside that neighbouring country. 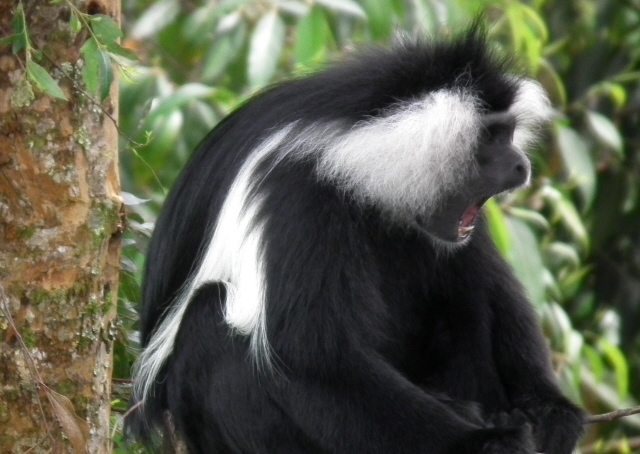 Still, Akagera's resident populations of giraffes, hippos, crocodiles, elephants, various antelopes, and yet more monkeys, are also worth an add-on extra couple of days safari (more info can be found under Nyarubuye, non-dark combinations). Outside those protected areas, Rwanda's land is worked to almost saturation point: every square inch of the hillsides and valleys seems to be used for growing crops. The resultant visual impression of an endless patchwork of small fields, interspersed with red dirt tracks and small dwellings, is quite a beautiful one, though. As regards the rest of the culinary experience to be had in Rwanda, well, food standards are said to be higher than in some other Central African countries (in part thanks to the legacy of Belgium having been the former colonizing country), but in my experience it wasn't outstanding. It was quite OK, just nothing to wax lyrically about (in this case quite in contrast to Sri Lanka! – see food & drink, top-10 countries). On the drinks front, the very typically African local tipple "banana beer" has to be mentioned. It is really more a kind of banana "wine" (given its strength and non-fizzy-ness). It is, as they say, an acquired taste. Personally, I found it quite intriguing, whereas my wife was clearly less than impressed. Local beers do the trick of being refreshing, even if they are somewhat bland standard lagers (except for a flavoursome dark ale variety called, a bit threateningly, "Turbo King", which I quite enjoyed … and it isn't as lethal as the name suggests). 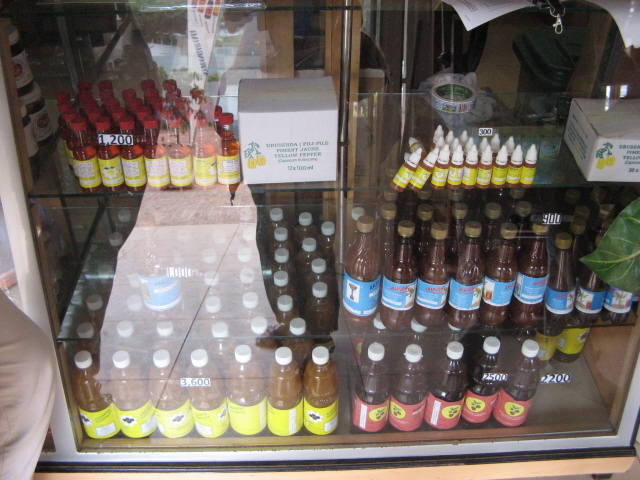 Juices, fizzy drinks and bottled mineral water are available everywhere and inexpensive. Imported drinks, such as wines (mostly from South Africa) are expensive, but otherwise costs for food & drink are moderate (at least outside luxury hotels). Rwanda's climate, despite the proximity to the equator, is quite temperate, thanks to the general elevation – between just under 3300 feet (1000m) above sea level in the east to 10,000 to 12,000 feet (3000-4500m) in the Virunga Volcanoes in the north-west. Especially at higher elevations, nights can get rather chilly. Sunny days can warm up the land, especially in the valleys (and in Kigali), but it hardly ever gets really stiflingly hot. Rain, esp. thunderstorms are frequent, and between March and June the really rainy season can make some roads impassable and is thus not a good time for travel in general. This is also true from a dark tourism perspective: esp. in April, around the anniversary of the genocide, the relevant memorials should be left to the local population for their own commemorations. The best time to visit is thus either the long dry season from ca. June to September or the shorter one between mid-December and mid-March. Finally: is it safe? This seems to be the first question of many in the West when they first hear of the possibility of travel to Rwanda (or Central Africa at large). The answer, these days, is: yes. The country has come a long way since the 1990s and is now one of the most stable and secure ones on the continent. It is still Africa, not Switzerland, and the fact that there are still underlying tensions cannot be denied. Nevertheless, the success story performed by Rwanda since the genocide is really utterly impressive. Not only is Rwanda's coming to terms with its grim past an exceptional model for dealing with such incredibly difficult issues (e.g. Cambodia, which is only now beginning the process, could learn a good deal from Rwanda! ), also the effects this process has had on society and the economy. Reconciliation is a general priority of the nation, and in economic terms it is now aspiring to become something like an African Singapore – a hotspot for foreign investment that the whole region could benefit from. These developments are, naturally, most visible in the capital Kigali. Outside the cities, on the other hand, the rural scenes do still show clear signs of deep poverty. So the Rwandan success story still has some way to go to be more all encompassing than it is as yet. Overpopulation is a severe problem aggravating the hardships of the countryfolk – not to mention the environmental impact. 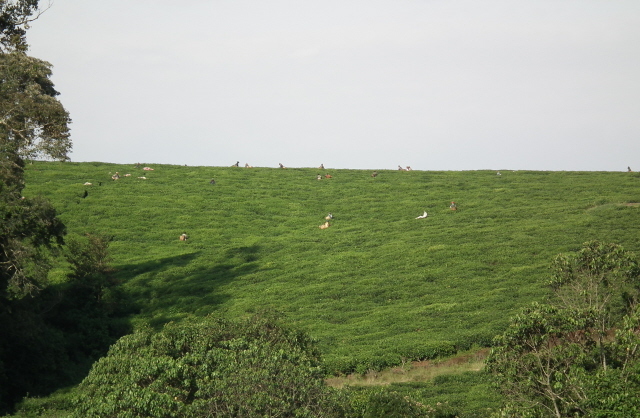 However, Rwanda also sports some surprisingly strict environmental protection regulations. Foreign tourists encounter this in the form of the complete ban on plastic bags – so make sure you don't bring any in your luggage! The restriction may appear a bit quirky at first, but it does of course make a lot of sense. Italy has recently introduced an equivalent ban (as the first nation in Europe) – and when I told my Rwandan guide that the great Italy was following little Rwanda's example, he was as bemused as he was proud. Contemporary Rwanda has indeed a lot to be proud of – and the attraction includes tourism, which, too, is constantly being developed further. So do go! You won't regret it. It's almost unique as a place where you can combine the very darkest in dark tourism with the most beautiful and stunning (and uplifting!) nature and wildlife viewing. Getting around Rwanda on an independent basis is possible, but poses its own challenges. Public transport is mostly by bus or, more so, minibus – with the concomitant restrictions on how much luggage you could take. It also doesn't necessarily get you to the spots you want to go and see, so additional taxi or scooter rides will be necessary. The language barrier also needs consideration. Unless you speak the local Kinyarwanda, it can get tricky. French is most the widely spoken foreign language (another legacy from Belgian colonial times), while English is only slowly catching up. If you can halfway afford it, hiring a guide with a car is really worth the extra cost. Most tour operators offering tailor-made itineraries in Rwanda work on that basis. There are also group tours, but those won't be of much interest to the dark tourist. Neither do the vast majority of tour operators look much beyond the prime wildlife attractions of Rwanda, in particular gorillas. Very few actively offer insights into the dark legacy of Rwanda too, though. Although I found one Rwandan owned eco-tourism operation (Wildlife Tours Rwanda) whose portfolio even includes visits to a "reconciliation village" where survivors, perpetrators and returnees from exile face the challenge of living together.